By Catalina Iorga, March 10, 2012 at 11:15 am . David Berry, the second speaker of the Software Matters session at UnlikeUs #2 conference, took the audience on an informative journey into the ever-increasing scale and importance of software. Berry’s talk aimed to provide a basic understanding of the role played by software in contemporary society, then to present ways of exploring and studying software, and finally, to give a substantive example of what kind of software we, as Web users, deal with on a daily basis: web bugs. In a rather poetic and techno-deterministic fashion, Berry presented software as a giant piece of machinery whose wheels keep turning at night, while we sleep unaware that “networks of machines silently and repetitively exchange data”. But this well-oiled system – which monitors, controls and assesses the world through electronic sensors, constantly calculating and recalculating, and producing reports, predictions and warning – needs billions of lines of code, continued maintenance and technical support to keep running smoothly. For instance, Boeing’s 787 Dreamliner aircraft relies on 6.5 million lines of code to operate its avionics and onboard support system alone. But these technical behemoths operate on much larger levels than an aircraft, Berry pointed out, as they control and organize networks that permeate all levels of our society, be they areas such as finance, telecommunications, roads, food, energy, defence, law or government. 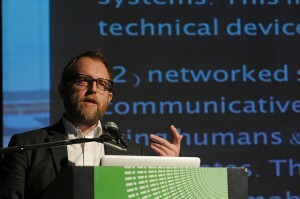 Having established the scale of software and its penetration scope, Berry proceeded to conceptualize software as something that enables the delegation of mental processes of high sophistication into computational systems, which instills a greater degree of agency into the technical devices than mechanical systems. Berry emphasized that networked software encourages a communicative environment of feedback mechanisms tying human and non-human actors together into new assemblages. These undertake impressive calculative feats, mobilising and developing ideas at a much bigger intensity in a real-time stream, which feeds information to us and through us. The big question remained: how to think software? Berry offerred two possibilities: one, as a super-medium materialised into particular code based devices – a framework that encourages questions of regulation in terms of media and communication policy – and two, software and code as ontotheology. In the latter, software acts as a translucent interface to the world, but also as opaque machinery that mediates engagement. Software can be seen as an ecology, made possible by a plethora of computational devices, with two faces: commodity (via the interface / surface, providing relative stability for consumption of ends) and mechanism (a means, a substructure for the overlay of commodities and consumption). To read this complex ecology, Berry advises, it would be wise to pay particular attention to the affordances of code: what it simultaneously enables and constricts. An eloquent example of the web software spuns around us comes in the form of ‘web bugs‘ (or ‘web beacons’). These bugs, such as Facebook’s ‘Like’ button, consist of code embedded in seemingly benign surfaces, but that actively and covertly collects data about users. Berry understands beacons as compactants (computational actants), designed to passively-aggressively record data. Compactants are passive under the surface, but aggressive in gathering behavioral signals and affective streams. For an example of how to track compactants, I suggest checking out the work of Anne Helmond and Caroline Gerlitz, briefly illustrated in this blog post, Visualizing Facebook’s Alternative Fabric of the Web.